Medication has had limited effect on memory. And that’s unfortunate for anyone suffering from memory problems due to specific illnesses or ageing. But now researchers from the Mayo Clinic report that tickling the brain with low-intensity electrical stimulation in a specific area can improve verbal short-term memory. What this means is that these findings might lead, one day, to devices that can actually stimulate the brain to improve not only memory but also cognitive health say experts. In the meantime, here are five easier ways you can “tickle” your brain for better memory. When the area on the sides of the head by the temples and ears were tickled, researchers found that word recall was enhanced. Patients recalled more words from a previously viewed list when low-amplitude electrical stimulation was delivered to the brain’s lateral temporal cortex. One patient even reported that it was easier to picture the words in his mind for remembering, reports the Mayo Clinic. “The most exciting finding of this research is that our memory for language information can be improved by directly stimulating this underexplored brain area,” said Michal Kucewicz, Ph.D., co-first author and researcher for the Mayo Clinic, Department of Neurology and co-first author. The stimulation says Dr. Kucewicz compares to “tickling” the brain. Testing the memory was done on patients who were undergoing evaluation for surgery to address seizures. Participants agreed to have their memory “tickled” with electrodes implanted in their brains. It’s not uncommon for people with epilepsy to have memory problems. Because the brain circuits that trigger memory function are often affected by epilepsy. Among 22 patients, researchers found that memory was enhanced in four patients whose lateral temporal cortex were stimulated. But not among those patients who had other parts of the brain stimulated. So, pending further research, what other ways can we “tickle” our brains to help improve our memory — without using electric probes, of course. A strong memory depends on a healthy brain. So, how do you make your brain healthy? With the right stimulation. The human brain is capable of adapting and changing even as we grow older. That’s neuroplasticity! Neuroplasticity is basically the brain’s ability to reshape itself through life. Gone is the old adage that “you can’t teach an old dog new tricks.” You can learn and improve your memory even as you age — here’s how. When you spend your entire work day on a computer it’s hard to sit down and read a book — especially when the movie’s available on Netflix, right? Well, here’s the thing about reading and your brain. Neuroscientists have discovered that reading can actually improve your brain on many levels. Research from Emory University found that being absorbed in a good book improves connectivity in the brain and brain function. In fact, reading, let’s say, a good piece of fiction not only strengthen memory, but also learning, speech and the interpretation of sensations. Studies show that exercise can help reduce the risk of developing memory problems. However, few studies have actually looked at whether it can help people who already have memory problems says Dr. Liu-Ambrose for the Center for Brain Health — until now. Research published in the journal Neurology, concluded that performing aerobic exercises — even walking — just three times per week may help preserve memory function in older people with existing cognitive impairment. Yes, our brains need fat, but too much fatty food can also be bad for your memory, suggests a study from Brigham and Women’s Hospital. Study participants who ate high amounts of saturated fats seemed to perform worse on tests of thinking and memory than those who ate less (but similar) fats. Food high in saturated fatty acid was linked to poor verbal memory. On the other hand, good monounsaturated fat improved verbal memory. So, when it comes to fat choose healthy fats like walnuts and avocados that help fight inflammation in the body and brain. Too much sugar is not only bad for your waistline but also for your memory. Research from the University of California found that a diet high in fructose damages memory and learning. The animal study, published in the Journal of Physiology, looked at how high-fructose syrup in soft drinks and processed foods affect brains. Rats, fed a steady intake of concentrated fructose for six weeks, were tested to see if they could find their way out of a maze. The sugar-high rodents’ cognitive abilities declined significantly, and they seemed to struggle to remember their way out of the maze. Additionally, they were generally slower, and their brain cells dropped when signaling each other. The bottom line, any mentally stimulating activity is good for the brain. So, get off the couch, stop binge-watching Netflix and try some “mental gymnastics.” Read, take courses, try math problems or test your IQ online. 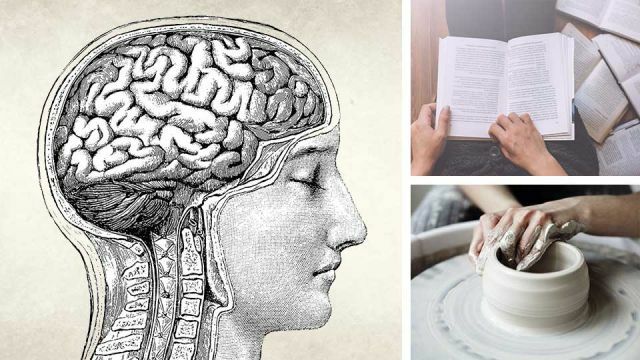 Start a hobby and begin experimenting with things that require both manual dexterity and memory, like painting, pottery, photography — basically anything that interests you. It really doesn’t take that much to learn a few new tricks, reshape your brain and improve your memory. Hey Buddy!, I found this information for you: "5 Ways To Tickle Your Brain For Better Memory". Here is the website link: https://www.thealternativedaily.com/5-ways-tickle-brain-better-memory/. Thank you.